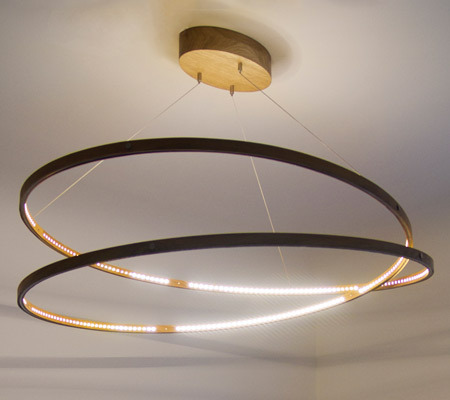 „infinity“ – an elegant, elliptically shaped pendant light enchants the observer with its visual illusion: one meter in diameter and six meter extent of this impressive, bold design appears to have two overlapping and floating ellipses. In fact, there are two elaborately nested rings which are created of a single element without any contact between each other. 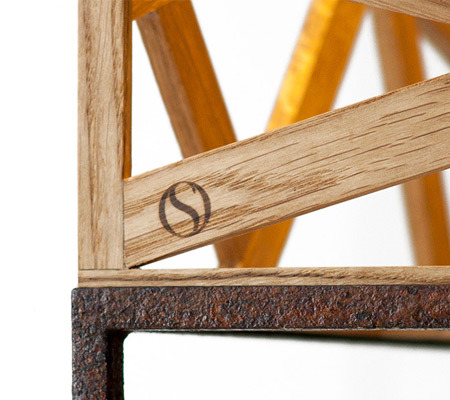 The frame of the object is made of stainless steel and coated with solid oak. 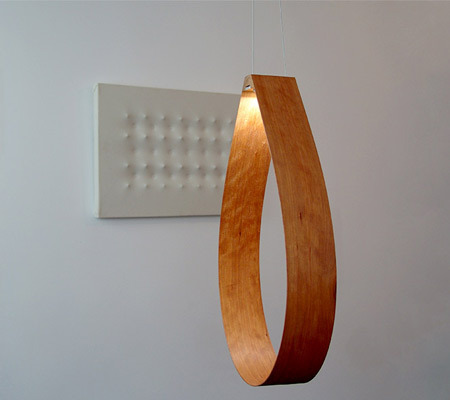 The LED light source is placed discretely on the inner surface of the lamp. Due to its subtle atmosphere and fascinating multiple shadows, “kubus” plays a special role in any interior design. It features a timeless shape and a minimalistic, unique look. 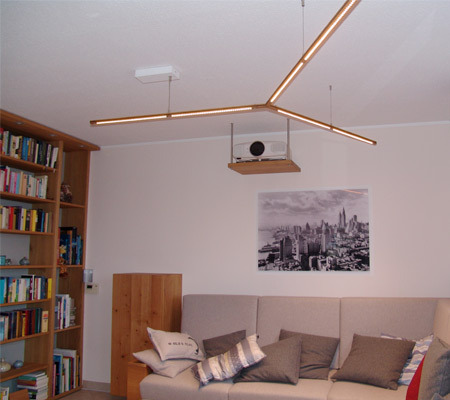 Due to the internal placement of the LEDs, the light source is only visible at second glance. Each object is unique and is made by hand using untreated wood and lots of attention to detail. 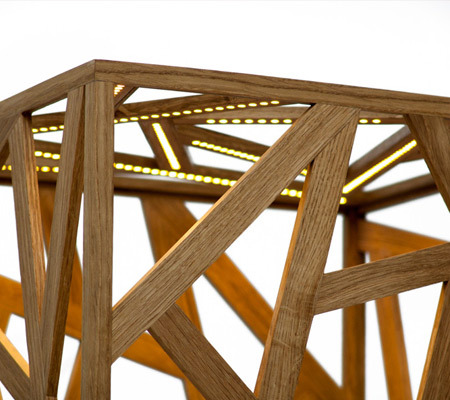 “kubus” features a wood selection of oak, maple and walnut. The base is available in stainless or oxidized steel. Individual requests for customized variants and sizes are welcome. The German Design Award is the international premium prize of the German Design Council. 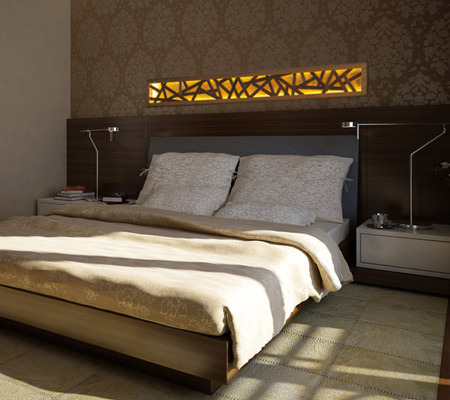 Their goal is to discover, present and highlight unique design trends each year. 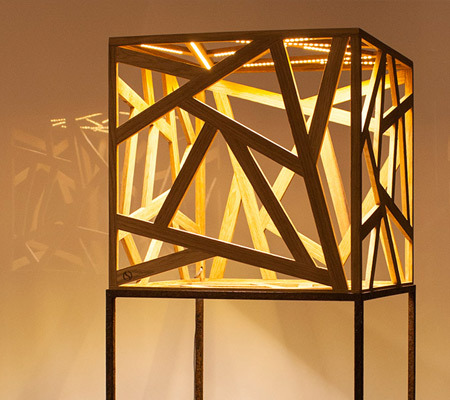 The hand-crafted lighting object “kubus” of the lighting manufacturer “lumen’OS” has been nominated by the committees of the German Design Council for the German Design Award 2016 – Excellent Product Design. 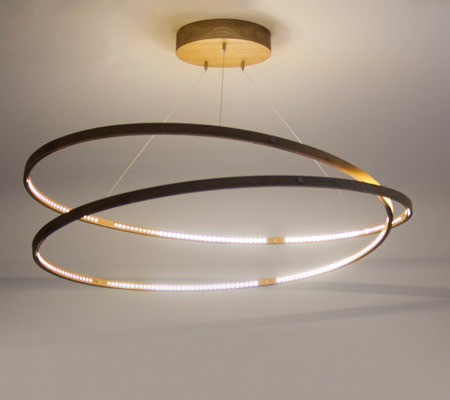 “kubus” impresses with its timeless shape and its subtle, unobtrusive aesthetics. 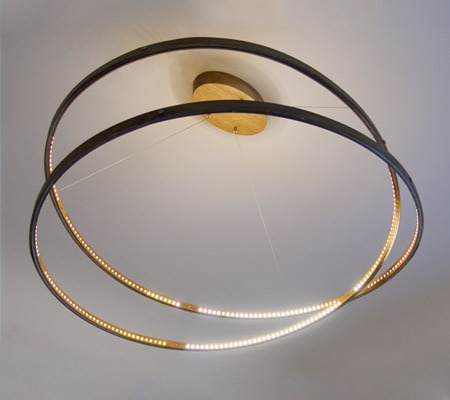 The exclusive lighting object captivates through its elegant design and the harmonious interaction of material and technology enhancing any interior space. 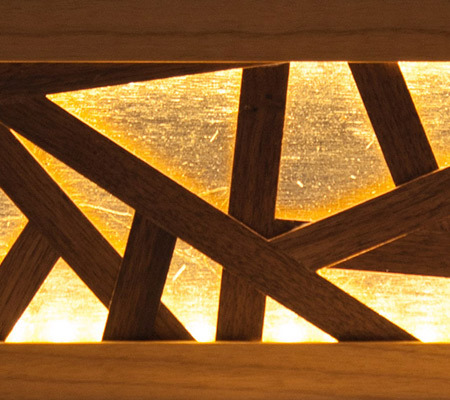 Each unique piece is handcrafted in filigree design from around 100 pieces of wood. 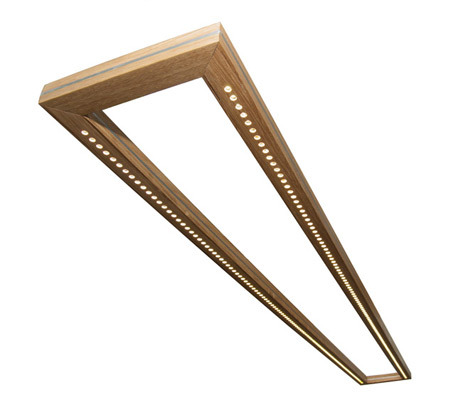 The energy-efficient LED light source can be switched on and off without any contact and can only be seen at second glance due to the internal alignment of the LEDs. The German Design Award, initiated in 2012, is already one of the most recognized design competitions worldwide and enjoys a high reputation far beyond the professional circles. The prize is awarded to top-class submissions from product and communication design, which, in their own way, are ground-breaking in the German and international design landscape. 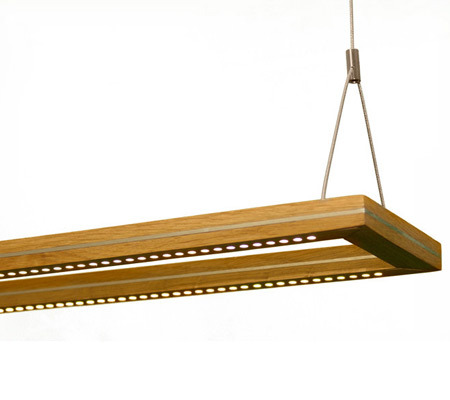 The pendant light „orthogON“ features a minimalistic design and is ideal to hang above your dining table, a kitchen island or a bar counter. “orthogON” can be delivered in various sizes and comes with a selection of regional wood types such as maple, oak or walnut. 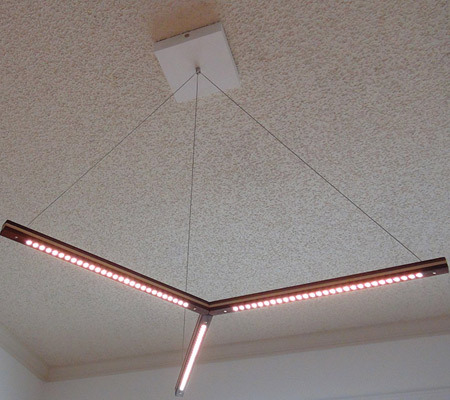 The rectangular lamp consists of two high quality LED strips. Due to their beam direction, they can point the light source where it’s needed. Make yourself comfortable at a campfire of a new era and enjoy the cozy light in your favorite living space provided by “flammu”. 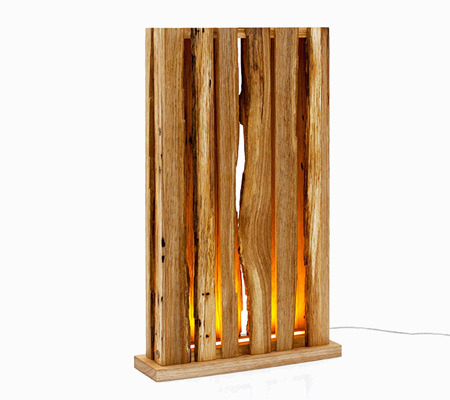 The design of this compact light object interprets the fire element combined with the technical details of today: powerful, untreated wood creates an ideal atmosphere due to its warm light. 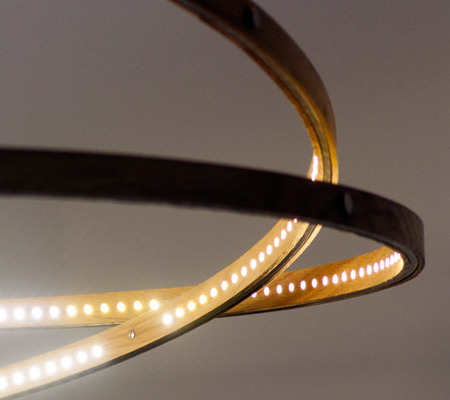 Energy efficient LEDs are integrated in the base almost invisibly. 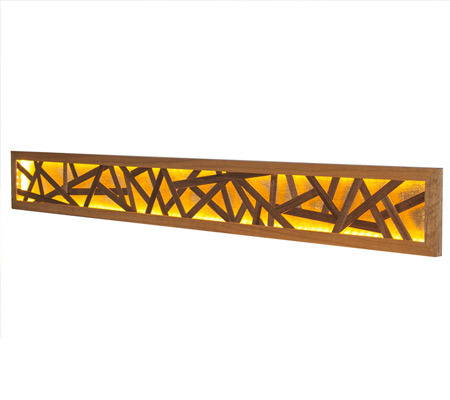 During daytime „flammu“ is a decorative piece on any dresser, shelf or table, and in the evening it creates an atmospheric ambiance in your space. 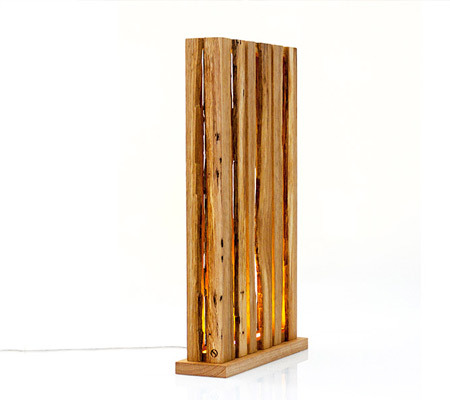 It is also an ideal decorative piece in a rustic, nature-oriented ambiance such as sport hotels, spas, vacation homes, shops or in any interior of modern farmhouses. 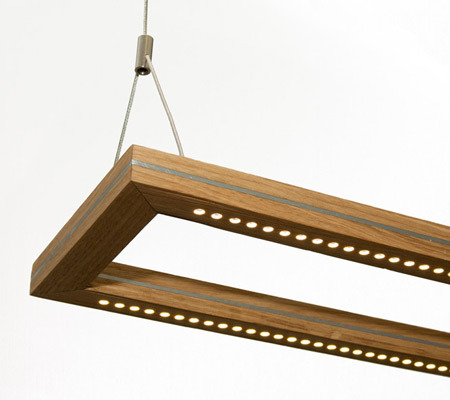 „flammu“ is available in oak, walnut or maple wood. Upon special request, various shapes and wood types can be customized. Just like its shape is also its name – the pendant light „ypsilON“ has a timeless look where functionality meets design, and it creates a pleasant light. 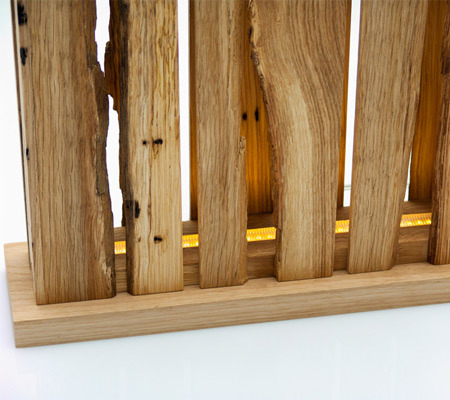 It consists of three wood layers and is available in various sizes depending on your lighting requirements and the intended use. The name “ypsilon” derives from the Greek and means „simple, unpretentious”. 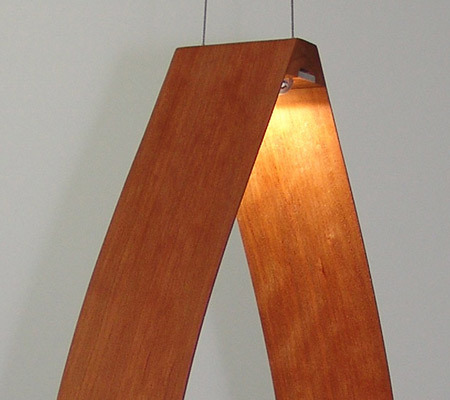 Due to its sleek lines, the design of this lamp is also simple and unpretentious. 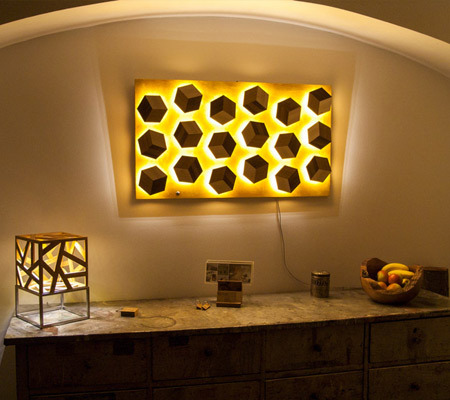 Due to its slim design, the decorative light “maimai” fits on any dresser or shelf, but can also be mounted to the wall to add character to your home design. 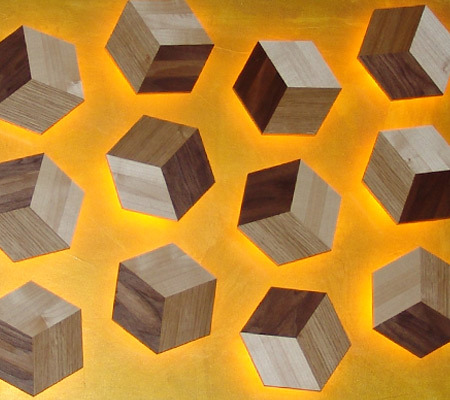 The decorative lamp is made of European walnut. 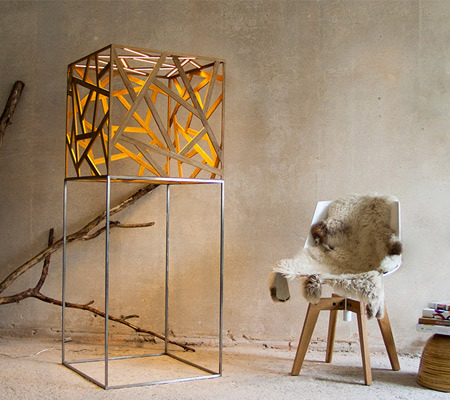 The lamp’s backdrop features gold foil, however this can be customized to other colors and materials. 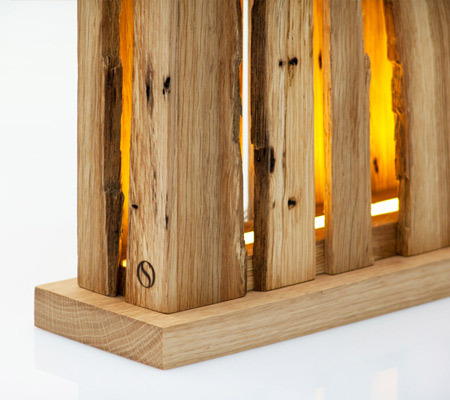 We are happy to discuss your individual requests with regards to the size and types of wood to create your unique custom lamp. 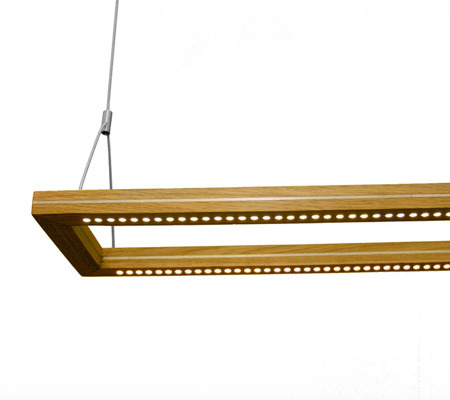 This lamp called “drop” was inspired by “water” and “light”, both essential elements in our lives. 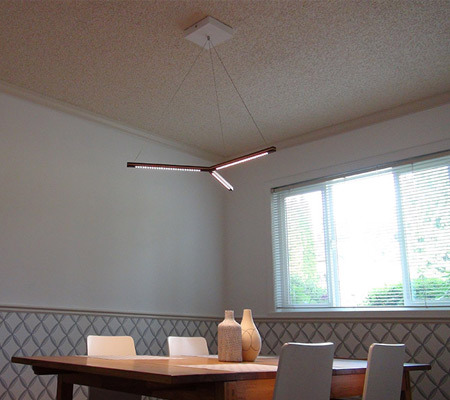 Featuring the shape of a “drop”, it is the ideal light for creating aesthetic installations in living rooms, shopping centers, hotels and restaurants. If several “drops” are suspended from the ceiling, an overall picture can be created that is reminiscent of raindrops. Its programmable control device allows the light sources to be adjusted to give the overall impression of rain. Chaos or order? Art or matrix? 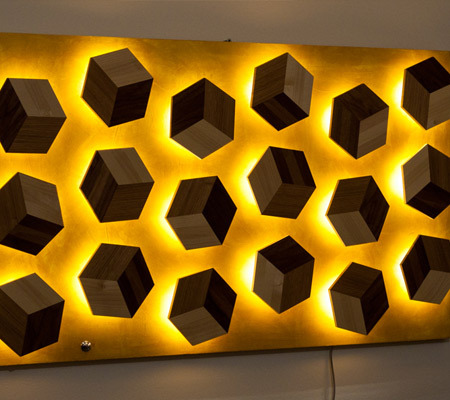 As the name suggests, this wall decoration lamp “mARTix” combines both and creates a pleasant reflection as well as a wonderful glow projected off its golden backdrop. 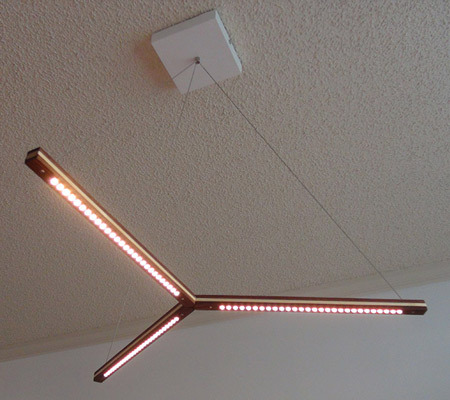 Due to the freely rotating cubic elements (chaos) as well as the ordered light effects, “mARTix” creates a third dimension and gives the impression of floating matrices in gravity.